My father has always been brand conscious when it comes to purchasing tools and appliances. His buying philosophy is you can never go wrong with a tried and tested name. I may not be familiar with his brand of handyman tools but I can vividly recall the name SHARP imprinted on our TV and some of our appliances as I was growing up. There was a time when my younger cousin was learning how to read and he started sounding off the letters s-h-a-r-p but when he was asked to read it he said TV! We couldn’t quite dispute his answer since the brand SHARP was synonymous to TV in our household. We have gone from black and white model up to the LCD ones that are available now and I don’t even recall my dad changing TV brands at all. I also remember my grandmother always having a SHARP radio on her side whenever we come to visit. She keeps it close so she won’t miss out on her favorite radio drama program. Our family is just one among the millions of households that also put their trust in SHARP appliances. This Japanese technology group started out with the manufacture of belt buckles and pencils a hundred years ago. Their product lines may have evolved into electronics, appliances, IT and other modern innovations but their commitment to quality still remains the same. 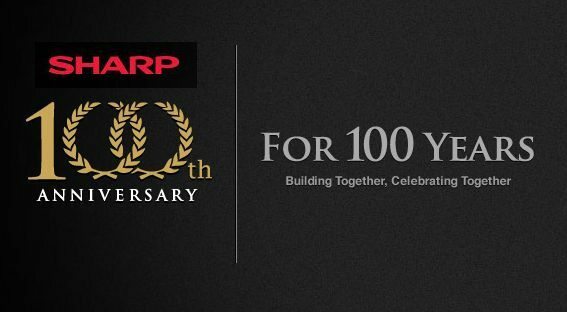 To celebrate the milestone of their 100th year, they launched the Sharp 100 years Anniversary Share Campaign. It is another innovative way to forge a bond between us consumers and the brand that has become part of our household over the years. This campaign is open to everyone (from countries such as Indonesia, Malaysia, Philippines, Singapore, Thailand, Vietnam, Australia, New Zealand, U.A.E.) who would like to share their anniversary or commemorative pictures and videos with family and friends. The approved images will be compiled and featured in the website throughout the campaign period which runs from June 16 until September 15, 2012. Winners will be chosen based on the amounts of “Votes” or “Likes” that the photos and videos will receive. Have your fb “like” and #Sharp100 tweets ready to go once you upload your materials. Start going through your scrapbooks and digital files now and get a shot at winning a trip to West Coast USA. Those who can make it to the top 5 ranking photos and videos will also get great quality SHARP products that we have come to love. Don’t get left behind, stay sharp and visit share.sharp100years.com for more details on how to win these cool prizes. We also had Sharp TV back in the 90s. I have a 14″ sharp TV with a tear-jerking story 😉 it’s been with me since 1999. We have a Sharp TV before. When we transferred back to our hometown, we sold it to a neighbor in Bacolod City. When we visited, the TV was still there functioning. Ay, our Sharp bought by my dad in the early ’80s is still working fine.